Switzerland’s Solar Impulse 2 (Si2) is designed to fly around the world on solar power. Its wing span of 236 ft. is greater than the wing span of a Boeing 747. The high aspect ratio wing maximizes aerodynamic efficiency. Power is generated by more than 17,000 high-efficiency solar cells, with a daily generation capacity of up to 340 kWh. In comparison, my home solar electric system can generate 22 kWh on a good day. 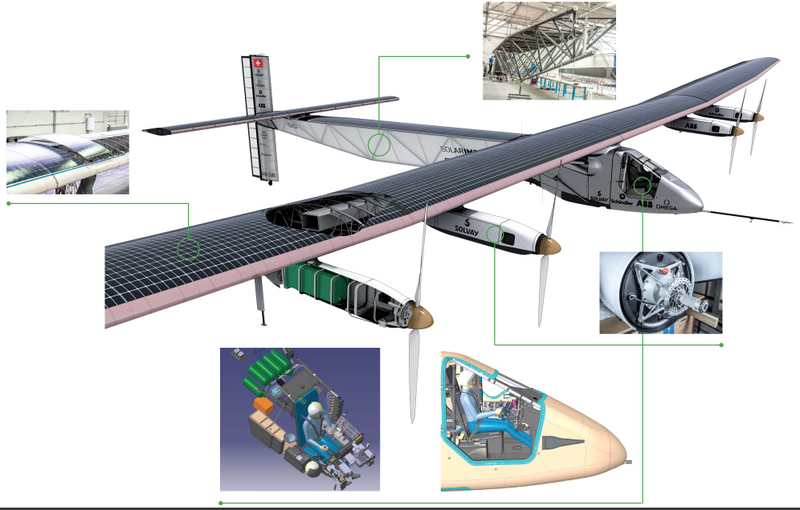 Built with carbon fiber structures, Si2 weighs only 5,070 lb., but a bit more than 1/4 of that is for the batteries. Check out the Solar Impulse 2 website for detailed information on how this remarkable airplane was designed and constructed to meet the challenges of its mission.